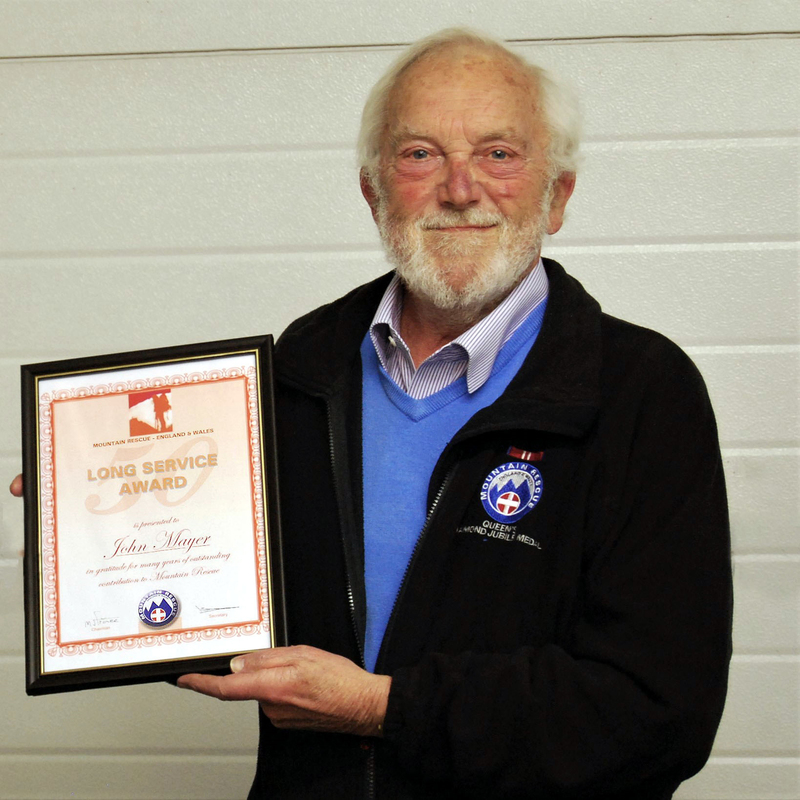 Buxton Mountain Rescue Team is sad to acknowledge the death of John Mayer the team’s most senior member who joined the rescue team in 1965 during its very early and formative days. John, originally from Manchester, was a skilled rock-climber with great experience of the crags in Wales, the Lakes and Scotland. As a life-long lover of the great outdoors he would willingly volunteer to help those in need of assistance on the Peak district moors and almost accidentally became part of the newly forming rescue team in Buxton. In the days long before mobile phones and GPS navigation devices people lost on the moors was the most common call to the team. Searches would often start in the middle of the night and last for many hours before the casualties would be located and finally carried back to warmth and safety. John, with a small band of like-minded friends were dealing with just a handful of calls each year but started from scratch to build the modern rescue team which today deals with over 100 calls a year. In the beginning the team had no base of its own, limited, basic equipment and only a few members had cars. John would recall memories of waiting with others on Buxton Market Place for someone to arrive with knowledge of what the call-out was about and hopefully with some transport to get them up to the moors. Eventually, after forty years, John stood down from the frontline action and took on a new role as Call-Out Co-ordinator responsible for ensuring sufficient team members would turn out to deal with a reported incident. Finally, as new technology made much of this role redundant, John took on regular checks of the team vehicles and rescue equipment following their return from a call-out. A task for which John was still volunteering just twelve months ago. A Long Service Medal from St John Ambulance, The Queens Golden Jubilee Medal, The Queens Diamond Jubilee Medal, and Appreciation of Long Service Certificates from both the regional body, The Peak District Mountain Rescue Organisation and the national body, Mountain Rescue England and Wales. Countless people unwittingly owe a great deal to John and his never stinting voluntary contribution which enabled Buxton Mountain Rescue Team to grow from just an idea into a skilled and busy community service. Throughout his half century of commitment to the rescue team John had the precious support of his wife Julie who was by his side to the end of his long battle with cancer. John will be sadly missed. A stalwart member who can never be replaced. What a man, legend even. Was an absolute pleasure to have known John, a real salt of the earth chap, with a great sense of humor. John will be missed by many. ‘Buxton John from Buxton Control. You have been a remarkable and well respected member of BMRT. Always a great bloke to have around; whether on a night out or at the end of a phone at 2am for a call out. An absolute legend of the pitch also, with good reason he is ‘Uncle John’, and always shall be to our family. Missed & Remembered..